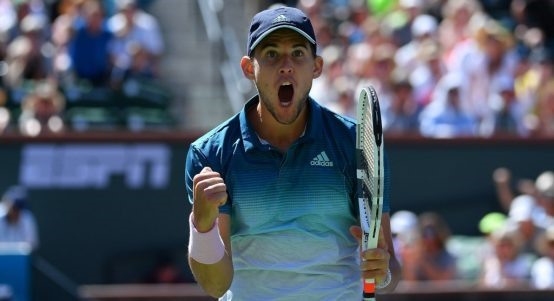 INDIAN WELLS — Dominic Thiem denied Roger Federer a record sixth Indian Wells title, beating the Swiss great 3-6, 6-3, 7-5 on Sunday to claim his first ATP Masters 1000 crown. The 25-year-old Austrian, ranked eighth in the world, had fallen in two prior Masters finals, both in Madrid. But he rallied for a third career win over Federer in five meetings, his first over the Swiss on hard courts. "I think it’s not my right to congratulate you, you have 88 more titles than me," Thiem told Federer as he accepted the trophy. "It’s been a great week for me, even though it didn’t work out," Federer said. "Congratulations to Dominic -- wonderful week and great play at the end.